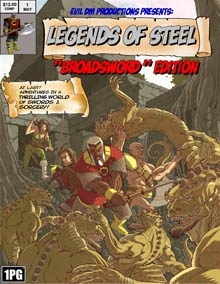 Please note that you must own a copy of the Broadsword 1PG game for this to be useful to you! Explore the world of Erisa and battle its cutthroats, assassins and foul beasts as you cut your bath to glory in a crimson swath of blood, treachery and deceit in this, the first sword and sorcery supplement for the acclaimed game of fantasy for Deep7's 1PG System. In side you will find new Advantages, genre-convention notes for the Referee, a full-color world map, country writeups for Erisa, information of the gods, a bestiary, sample characters and a introductory adventure, River Pirates of the Belsa.